Tourism is still pretty new to Bhutan; the Bhutanese were and still are very much an agrarian mountain people with one foot planted in their deeply spiritual past, so it’s imperative to visit this otherworldly kingdom with a sensitive and open mind informing all aspects of your trip. Meet & Greet on arrival at NJP Railway Station and transfer to Phuentsholing - The Gateway of Bhutan by Road from India. It is a thriving commercial center on the northern edge of the Indian Plains. On arrival check in at the hotel.Overnight stay at Phuentsholing. After breakfast complete the immigration formalities and transfer to Thimphu (7,710 ft.) the capital city of Bhutan. On arrival check in at the hotel. In the evening, visit the TashichhoDzong (Fortress of the Glorious Religion). Overnight stay at Thimphu. After breakfast visit KuenselPhodrang (Buddha Statue) a place for refreshing with a huge statue of Buddha on the top of the KuenselPhodrang, National Memorial Chorten(Monument) & Folk Heritage Museum. Afternoon visit Sangaygang View Point, Changangkha Monastery, Taking Preserve Centre, The talking national animal of Bhutan can be seen here TashichhoDzong (Fortress of the Glorious Religion). Overnight stay at Thimphu. After breakfast visit KuenselPhodrang (Buddha Statue), King's Memorial Chorten(Monument) & Folk Heritage Museum. Afternoon transfer to Punakha / WangduePhodrang (4,300 ft.), via Dochu-La-Pass (10,170 ft.) to view the higher Himalayas. The pass also has 108 DrukWangyalKhangzangChorten which is believed brings multi fold merit to all sentient beings and which make the pass a must visit place. On arrival check in at the hotel. Overnight stay will be at Punakha / Wangdue. After breakfast check out from hotel with bag & baggage’s and visit the PunakhaDzong- built in 1637 by ZhabdrungNgawangNamgyal. For many years until the time of the second king, it served as the seat of the Government. The Dzong was named DrukPungthangDechenPhodrang (Palace of Great Happiness). 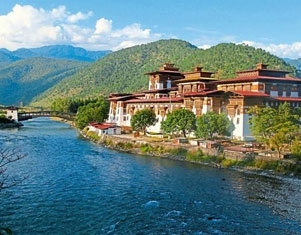 Punakha is still the winter residence of Je-Khenpo and King JigmeDorjiWangchuck convened the first National Assembly here in 1952. After that take a short excursion trip to visit the ChhimiLhakhang - The Temple, also known as “The Temple of Fertility” was built by Lama DrukpaKuenley, “The Devine Mad Man”. After noon drive to Paro. On arrival check in at the hotel. Evening is free for leisure. Overnight stay at Paro. After breakfast start full day sightseeing covering Ta Dzong - National Museum with an excellent collection of Bhutanese antiquities, RinpungDzong - the administrative seat of the district of Paro. Afternoon visit DrukgyelDzong - The Dzong was destroyed by fire in 1951 and is now preserved as heritage site & KyichuLhakhang - one of the oldest Buddist temples in Bhutan .Overnight stay at Paro. After breakfast excursion trip to Chele-La-Pass (13,088 ft.) – the highest motorable road in Bhutan. Enjoy the scenic beauty & memorable landscapes from Chele-La-Pass. Back to Paro. Rest of the day is free for leisure. Overnight stay at Paro. After breakfast check out from hotel and drop at NJP for your onward journey.